Clog is a quarterly architectural journal that "explores, from multiple viewpoints and through a variety of means, a single subject particularly relevant to architecture now". Each contributor is given a two-page spread to suscinctly address a particular aspect of a broader topic which in the past have included Apple and renderings. The current issue addresses "unpublished" architecture. Despite the expansion of architectural coverage both in print and digital media, most buildings go unexamined. This issue seeks to shine the light on some of these buildings that have slipped through the proverbial cracks. 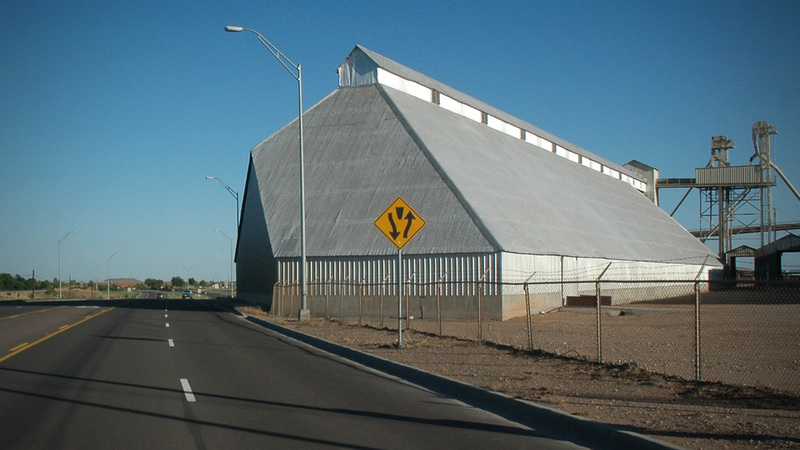 On the southern edge of Memphis, Texas sits a large metal building nearly identical to thousands of other agricultural structures in the region. These bulk commodity sheds were mass-produced by the Muskogee Iron Works in the 1920s and 1930s and could be ordered by mail through a catalogue. These “Muskogee Buildings” were long rectangular steel-framed constructions defined by steep roofs with conveyor galleries that ran along their peak. They exhibit elegance both in their functional efficiency and in their architectural form. In Memphis, however, the standardized building was made extraordinary by a unique collision of historical and political circumstances. When U.S. Highway 287 was widened from two to four lanes in 1957, forty feet of land was taken from the processing facility—an area that unfortunately included the corner of a Muskogee Building. Because of the structural redundancy of this building type, it was not necessary to demolish it in its entirety. The building was literally sliced, removing a corner from the shed to accommodate the widened highway. Through this series of events, the building’s standard typology was rendered exquisite in a transformative process that created a distinctive architectural form. The chamfered result acts as a record of the unique forces acting on the site. The scar tissue that a building develops as a result of political and cultural forces has the potential to be more generative and ultimately far more descriptive of the society that produced it. Just as the Mosque–Cathedral of Córdoba acts as an architectural index of Spain’s thirteenth century religious tensions, so too does the modified Memphis cotton shed illustrate the growing importance of the automobile in the middle part of the twentieth century in Texas. In both Córdoba and Memphis, the architecture is richer as a result of its acknowledgement of the complexities of the situation. A gross oversimplification of the modernist movement is that it sought to create ideal solutions to abstracted problems. The perfect acts of architecture that were published and placed within the pantheon of twentieth century design are compelling, but many are also naive. Far more persuasive are the scarred survivors that more accurately reflect the inherent messiness of the real world.